What a relief it is to know that you have a cleaning person on the way! It's an even bigger relief to know that your house will be cleaned with natural cleaning products, free of chemicals and other hazards that can be harmful to your family. One of the newest trends in home cleaning is a shift toward using natural "green" or hypoallergenic cleaning products. As we'll be explaining here, natural cleaning products can be found right in the kitchen cabinets of your home and they cost less than most cleaning products found in stores. What could be a better combination than saving time by finding cleaning help and a saving money by having your cleaner use natural cleaning products? Did you ever notice that on a box of baking soda there are actually instructions for cleaning use? And on some vinegar bottles there are also instructions for cleaning and disinfecting use. If the instructions are there then why not use them? It may not be what you are used to, but give it a try once and see how great the results are. And don't forget to try lemon juice as it, too, is one of the best in natural cleaning. When it comes to natural cleaning products, vinegar is the ultimate multi-purpose cleaner. It's best to first test the vinegar in a small area and to keep in mind to never use it on marble. Most people dilute vinegar with water in a spray bottle for easy spray cleaning. The only time to use pure vinegar without diluting it is when pouring it into the toilet bowl. Not only does vinegar clean wonderfully, but it also has disinfecting and deodorizing capabilities, so you won't have to worry. Once that vinegar is poured, those germs will be wiped away! Vinegar can also be used as a fabric softener and is used regularly by families whose skin is sensitive to other fabric softeners. Don't forget that you can ask your cleaner to help you with the laundry, too. Have her throw in a load and fold the clothes waiting for you in the dryer. It will be a tremendous help to know that you have fewer loads of laundry to do. One more note: Don't worry about the unpleasant vinegar smell. As soon as it dries the smell disappears! Lemon juice is another acidic based cleaner that is proven to be great for dissolving soap scum and hard water deposits. It is even known for shining up brass and copper. Then you can take the leftover peel and slice it up to run it through the garbage disposal. It will work well to clean out the disposal and leave you with a refreshingly pleasant smell. Because lemons are acidic, they have natural antibacterial agents which provide that reassurance to you that your home is not just clean, but also disinfected from germs. One more lemon juice tip: Mix it with olive oil to create a natural furniture polish for your hardwood furniture. 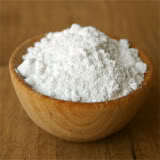 The best natural abrasive cleaner is baking soda. While it's best known for its deodorizing effects, baking soda can also remove stains of all kinds from garbage can stains to stains on clothes. In fact, once, the only thing that removed melted crayon stains from my son's pants was washing it numerous times in baking soda. That really proves the strength of this wonderful natural cleaner. One of the best aspects of baking soda is that you can get a small box for under one dollar. It may be one of the only great products left for under a dollar! Take advantage of these wonderful natural cleaning ideas and you'll be glad you did. And make sure you pass along these instructions and tips to your cleaning person!